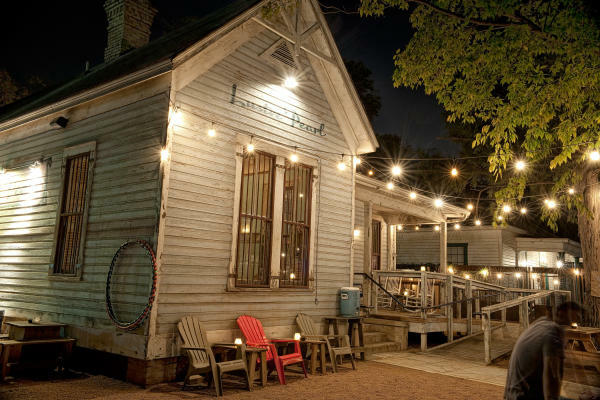 Austin&apos;s most unique entertainment district is lined with historic houses converted into bars with as much personality as the city itself. Whether you&apos;re looking for local brews, great food trucks or a rousing game of corn hole in the back yard, Rainey Street is perfect for a laid back night of socializing with friends. Night lights at Lustre Pearl. Courtesy Dunlap Properties. Staying true to Austin&apos;s roots, this strip of bars often features live, local bands. If your friends are anything like mine, the music is sure to induce awkward dance parties to music of all genres. After all, this is The Live Music Capital of the World: we deserve to lose ourselves in a cold mug of beer and a live serenade at the end of a long week. Lustre Pearl: This popular bar has an authentic and preserved character. Patrons enjoy beer, cocktails, hula hoops, concrete ping pong tables and food from the taco truck. Icenhauer&apos;s: Locals sip on specialty drinks named after women and local draft beers around the backyard fire pit. Banger&apos;s: Dishes up a plethora of inexpensive gourmet sausages. And, yes, there is a tattoo on their menu- and its free. Bonus tip: Rainey Street is the best place in Austin to spend Sunday Funday - bars are packed with eccentric people and live bands. And never miss the first Sunday of the month at Icenhauer&apos;s, where you can eat free chicken and waffles while sipping on the best spicy margarita in the city. Share your favorite places for weekend brunch in Austin or try to challenge my best pick for margarita by tweeting @VisitAustinTX with #TrueAustin.